As the name suggests, Karahi (Kadai) Chicken is prepared in the Indian wok known as ‘karahi’ in Hindi. 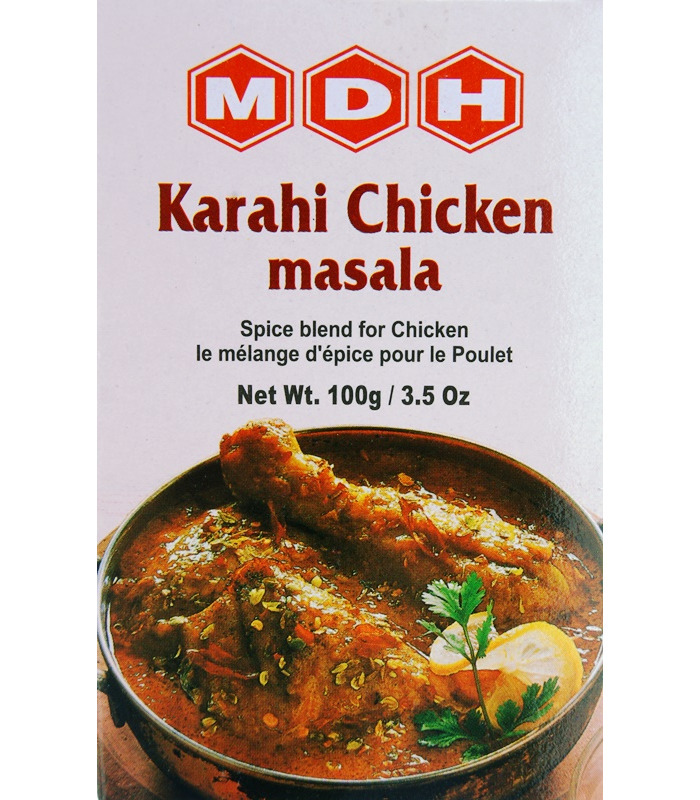 The MDH Karahi Chicken Masala has just the right balance of spices so you can give this North Indian and Pakistani specialty the perfect, authentic taste.Karahi Chicken t is prepared with paprika and has a thick gravy that goes well with naan, roti or rice. 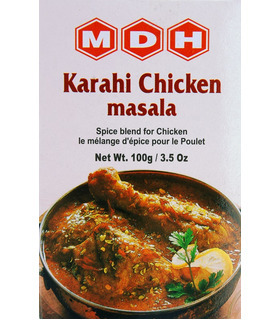 MDH Recipe: Karahi Chicken Serves 2-3 Method 1. In a deep heavy base pan heat 60g cooking oil and fry 150g chopped onions till translucent. 2. Add 500g chicken pieces and 10-15g Karahi Chicken Masala. Fry for 10 minutes till tender. 3. Add two cups of water and cover. Cook for 20 minutes till they are soft and tender. 4. Let 1/2 cup stock remain. Then add 30g capsicum slices and 60g tomato. Stir and fry for 5 minutes. 5. Sprinkle crushed Kasoori Methi and lemon juice. 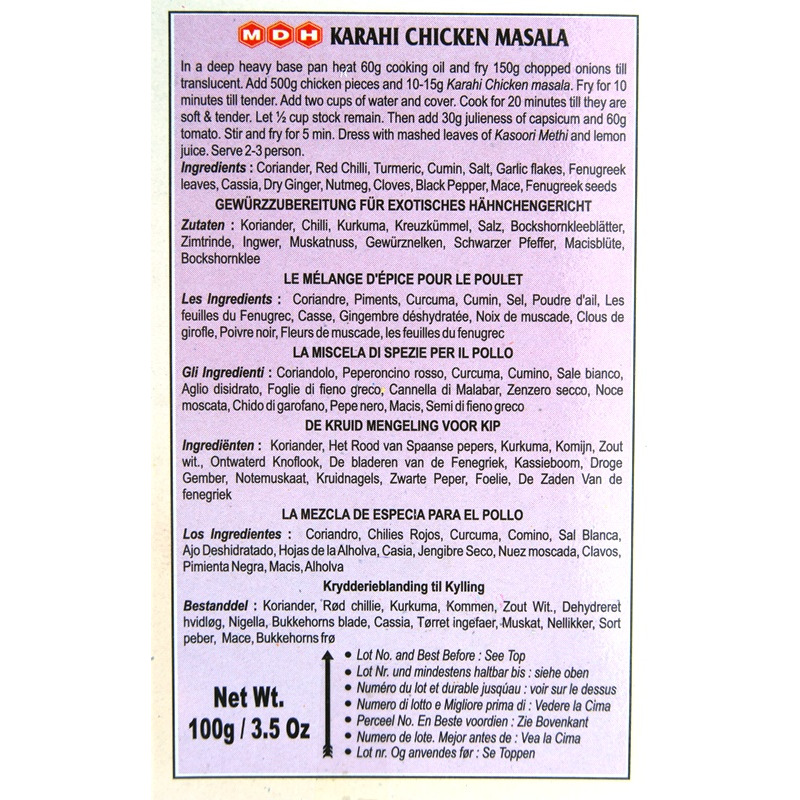 MDH Mix Ingredients Coriander, Red chilli, Turmeric, Cumin, Salt, Garlic Flakes, Fenugreek Leaves, Cassia, Dry Ginger, Nutmeg, Cloves, Black Pepper, Mace, Fenugreek seeds. As the name suggests, Karahi (Kadai) Chicken is prepared in the Indian wok known as ‘karahi’ in Hindi. 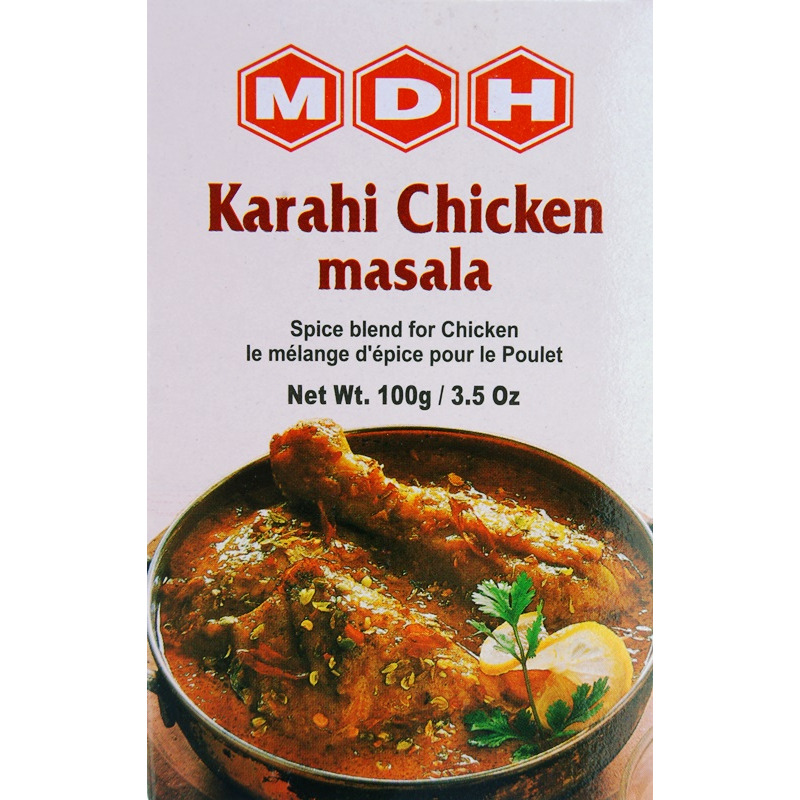 The MDH Karahi Chicken Masala has just the right balance of spices so you can give this North Indian and Pakistani specialty the perfect, authentic taste.Karahi Chicken t is prepared with paprika and has a thick gravy that goes well with naan, roti or rice. 1. In a deep heavy base pan heat 60g cooking oil and fry 150g chopped onions till translucent. 2. 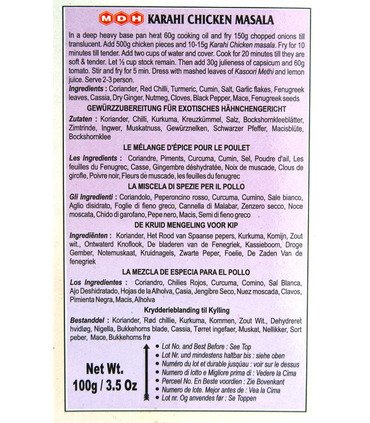 Add 500g chicken pieces and 10-15g Karahi Chicken Masala. Fry for 10 minutes till tender. 3. Add two cups of water and cover. Cook for 20 minutes till they are soft and tender. 4. Let 1/2 cup stock remain. Then add 30g capsicum slices and 60g tomato. Stir and fry for 5 minutes. 5. Sprinkle crushed Kasoori Methi and lemon juice. Coriander, Red chilli, Turmeric, Cumin, Salt, Garlic Flakes, Fenugreek Leaves, Cassia, Dry Ginger, Nutmeg, Cloves, Black Pepper, Mace, Fenugreek seeds.